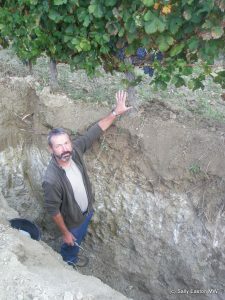 Domaine de l’Arjolle in the Languedoc makes a range of varietally-labelled wines under the IGP Côtes de Thongue appellation, including France’s only zinfandel, from their 90 hectares. 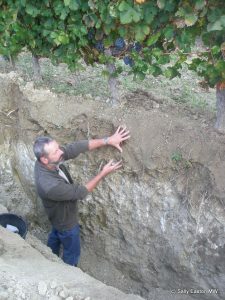 Charles Duby, their viticulturist gives a great session on the role of the soil. “Fifteen million years ago” he said “this was under the sea” explaining the limestone bedrock from the bottom of his soil pit. Firstly, to use ripping machines, which they haven’t used at d’Arjolle. Secondly, to keep grass and weeds in autumn and spring. “The roots aid water filtration” he said, and “we cut them in spring and plough them in” and this organic matter helps with nutrition and porosity as it rots down. 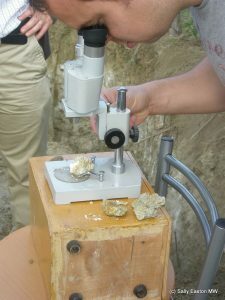 We examine the limestone content of the soil under the microscope. A microscope in the vineyard is an enjoyable first for me. Duby explains they do this, before planting, to determine what rootstock to use. 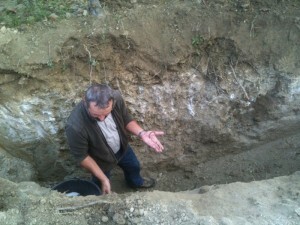 SO4 on limestone, and “if there’s less limestone, we use 101-49” he said. It all makes so much more sense when you stand there looking at it.